The Alps are home to some of the most luxurious holiday destinations on earth – and the ski chalets in Vebier certainly bear testament to that! What more could you expect when surrounded by the pure majesty of the Verbier landscape than complete opulence when you step inside one of the resort’s highly coveted chalets? From the moment our guests arrive in Verbier for the first time, it is apparent to them exactly why this snowy paradise is so special. From then on it is a journey of sublimity as you settle into your luxury chalet accommodation in Verbier. Chalet Tigre is a delightful Verbier chalet, perfect for large families and nestled high up in the mountains overlooking Patier. 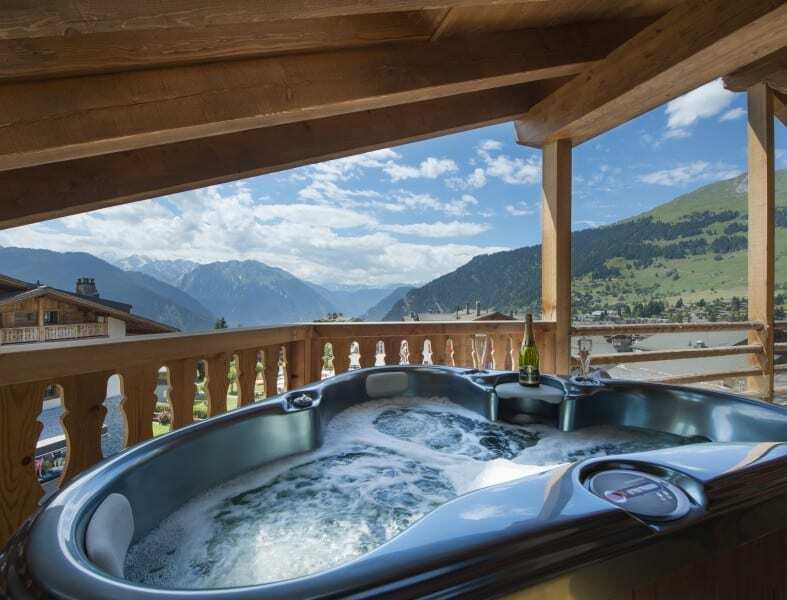 You can enjoy breathtaking panoramic views of the skyline from the indulgent outdoor hot tub or inside the main chalet and smaller mazot. Relax to a state of bliss in your private spa complete with luxurious hammam and massage area, or enjoy a family film in the private cinema. You could even taste some delicious wines in your stunning wine cellar. This chalet is designed with attention to detail, from the carefully selected fine art to stylish decor, wraparound balconies and a cosy stone fireplace. This exclusive new chalet was completed in 2011 and is a short stroll from the Medran lift station, allowing you to ski down the snowy pistes and straight to the door. Chalet Jasmine itself is a work of art, displaying local craftsmanship at its most glorious, with delicate detailing carved into the floors and ceiling, and bespoke wood and stone flooring throughout the stunning living spaces. With a state-of-the-art cinema, gorgeous indoor jacuzzi, and an impressive private library, this property fuses all of the charm of Alpine living with the ultimate in style. Chalet Spa is one of the world’s most exclusive and magnificent chalets of all. Blending contemporary design with outstanding external settings, this luxurious Verbier accommodation is a short walk from the Savoleyres lift station. The features of the chalet are not only aesthetically exquisite but designed with natural, locally sourced. Relax in your five-bedroom chalet with breathtaking views from the feature swimming pool and work out in the private indoor and outdoor fitness zones. Slide into your outdoor hot tub or convert the pool into a volleyball court. Furthermore, this beautifully placed chalet includes a deluxe private cinema and a games room for those days when you’re relaxing indoors. One of Verbier’s finest properties, the No.5 Penthouse is truly a spectacle in itself. This chalet was completed in 2012 to a diamond standard, using the most exquisite design. The stunning four bedroom penthouse apartment is located on the third floor of the building, boasting captivating views. You will have access to the shared spa facility which features a sauna, a gym and a Hammam. Every touch in this beautiful apartment oozes grandeur, from entering the large open plan living area to the extensive balcony with unsurpassed views; feel inspired with extensive balconies providing a portal to the jaw-dropping views of the mountains. Additionally, the chalet has a shared ski room and lockers to ensure that your equipment is safe and secure. Everything you can imagine is catered for in this wonderful chalet. Dent Blanche may be one of the most exclusive ski chalets in Verbier. Hidden in a secret location, your privacy and comfort is paramount in this immensely opulent chalet. With beautifully decorated bedrooms providing the perfect luxurious resting point, and lavish decoration throughout, you will feel truly treated with every second. Unwind in the indoor or outdoor jacuzzi, steam room or large indoor swimming pool. Alternatively, get a rush with a workout in your personal gym or enjoy a game on your personal croquet lawn. During the winter, you could even enjoy a game of curling or try out ice skating on your very own ice rink. This incredible chalet even has a party area with karaoke facilities! It really is the height of luxury. For more information about Chalet Apartment Rentals, our our sister company Luxury Verbier Rentals, contact us today and enquire about bookings, prices and advice of finding the right ski chalets in Verbier for you.